Microsoft yesterday made the surprising move to offer consumers more functional Office apps on the iPad after failing to drive Office 365 Home and Personal subscriptions, analysts said today. "Microsoft is feeling pressure from the bottom end of the productivity market," said Wes Miller of Directions on Microsoft. "In reality, they are doing this because of low uptake on consumer Office 365." 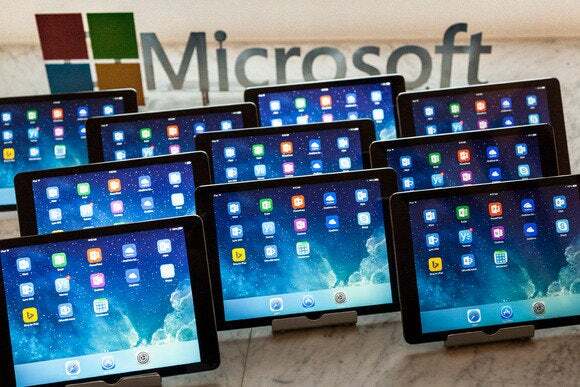 On Thursday, Microsoft moved what independent analyst Ben Thompson called Office's "scarcity line -- the line between paid and free" for the iPad by changing the rights consumers have when they run the free-to-download Excel, PowerPoint and Word apps. Prior to Thursday, consumers without an Office 365 subscription could use the Office for iPad apps only to view documents. Under the new rules, those consumers may also create and edit documents, although with numerous restrictions on the latter -- Microsoft called the missing pieces "advanced editing" -- that may be useful to a minority of tablet owners. Office on the iPhone and for Android smartphones -- dubbed Office Mobile -- went free for consumers in March on the same day Microsoft introduced Office for iPad, and so already came with those rights. Yesterday, Microsoft split Office Mobile on the iPhone into separate Excel, PowerPoint and Word apps; on Android, the collective Office Mobile app remained. Because businesses must still pay to use Office for iPad -- or Office on iPhones and Android smartphones now, as they likely will for the soon-to-be-released Office on Android tablets -- for commercial purposes, yesterday's changes only benefited consumers, a fact that many seemed to miss. Others agreed with Miller that Microsoft's carrot to consumers -- subscribe to Office 365 Home (for $100 annually) or Personal ($70) and get full rights to Office for iPad -- had not moved the needle on the consumer editions of the rent-not-buy model. "The reality is that Office revenue is on the business side," said Jan Dawson, principal analyst at Jackdaw Research, in a interview. Previously, Dawson had pegged total revenue from Office -- from both Office 365 and traditional perpetual licensing, with the latter dominant -- at $24 billion for the 2014 fiscal year. Just $3 billion came from consumers, representing less than 13% of the total. More to the point, consumer Office 365 revenue has grown much slower than subscriptions: Sales grew just 4% in the September quarter from the June period, while subscriptions increased 27% during that same time. With Office on mobile failing to spark Office 365 consumer sales, Microsoft rethought its March strategy, which at the time most experts had applauded. "The bifurcation of Office, with the free versions able to read documents but not do anything else, may have limited the uptake [of the iPad apps]," said Dawson. "The boundary between free and paid was very far toward the former because you could do almost nothing or you could do everything. I think Microsoft saw that the boundary was in the wrong place. "Because most of the revenue is on the business side, Microsoft thought, 'Why don't we just give away more features on the consumer side?'" Dawson said of the strategy switcheroo. "Previously, they were afraid to give away any kind of Office." Miller pointed out that the value of consumer-grade productivity software has "essentially reached zero." Google Docs is free to use for consumers and Apple began giving away its iWork suite last year to any iOS or OS X device owner. To compete, Microsoft had to reduce Office as far toward "free" as it could stomach. Thompson concurred. "This is powerful evidence that it is actually impossible to make money selling productivity software to consumers," Thompson wrote in his Stratechery subscription-only Daily Update of Friday. "If Microsoft couldn't manage, how can anyone else?" Assuming Miller and Thompson are right, what does Microsoft get from giving away Office? The firm is a corporation, not a charity. What's the value in free? "Because Microsoft wants to make Office the universal productivity app and its file format the universal format, so that it can perpetuate its business on the commercial side," said Dawson. There's not only truth to what Dawson said, but it's a tenet of Microsoft's overall Office strategy. Microsoft hammers on the fact that only its Office apps and applications can reproduce the Office file format in high-quality fidelity. Putting Office in front of more people, theoretically at least, increases the Office lock-in. Thompson echoed Dawson. "This new strategy is much more defensive in nature: Microsoft may not be able to drive new Office 365 subscribers, but ... they are immensely concerned about keeping people away from Google Docs, in particular," said Thompson. "Better to keep someone in the fold for free, with up-sell opportunities, then to incentivize them to try out your competitor." Not everyone saw the strategic shift in negative terms. "This is not a desperation move, or one from a point of weakness," countered Patrick Moorhead, principal analyst with Moor Insights & Strategy. "This is their multi-platform strategy in a nutshell, not some reaction to a tactical threat. They're simply delivering on their strategy, which is all about mobility and the cloud." But even Moorhead acknowledged that Microsoft hoped to prevent consumers from adopting Office alternatives. "They're trying to lower the number of people who look to a Google solution or something different," Moorhead said of the iPad apps' new rights. And while Microsoft might have been pushed toward the decision -- pushed just eight months after debuting it to much fanfare -- the analysts' consensus was that it wasn't only necessary, but the smartest move possible under the circumstances. "They have taken the killer app for Windows and made it accessible to the Web, to iOS and to Android," said Moorhead. "The BYOD [bring your own device] play is critical, and because Microsoft has the ability to leverage on other platforms what people access at work, it can force enterprises to pony up for access [to Office] on all an employee's devices. That's the real revenue maker for Microsoft."